When I was given the challenge of designing a cake that would fit for a royal wedding, I knew I had to design something a little over the top, but still classic and elegant. I think the new princess has a classic sophisticated appearance that I wanted to tie into my design. I don't usually do this, but, for this cake, I decided to make an inspiration board. 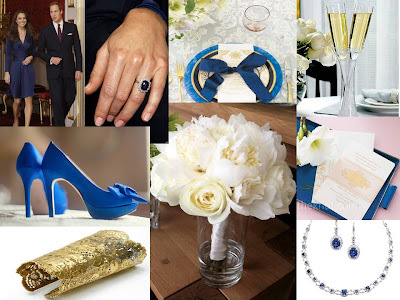 Of course, I wanted to tie in the color royal blue because of the ring and the dress she wore for her engagement photos. Also, I think that the color royal blue is appropriate for an April wedding. I also wanted to tie in gold because when I think of royalty, I think of gold. I wanted to make the cake elegant, modern, and bold, yet still have a classic look and feel to it. ﻿I made the flowers on the cake; roses, peonies, and calla lilies, in shades of ivory and white. I added looping grass blades to the cake for a modern touch. The band around the top and bottom tier was an imprint which I then went back and painted gold and blue. It was a long process, but it gave the look I wanted. In two words - ABSOLUTELY STUNNING. Every minute you dedicated to this cake shows - the detail - the execution - well done indeed. You surely have created a masterpiece.